Often used as privacy screens, Leyland cypress’ are marketed to homeowners as a beautiful, fast growing solution for their privacy needs. But what most nurseries neglect to tell homeowners is that Leyland Cypress’ really only thrive in well-drained soil and sunny locations. And even when properly planted and in the correct location, these trees are less than hardy. 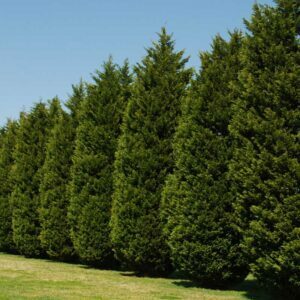 In fact, Leyland Cypress’ are susceptible to a host of diseases, insects, and environmental stressors. The increased frequency of these disease and insects attacking Leyland Cypress’ is seen because of the rise in popularity of Leyland Cypress’ as privacy screens. This species overwhelming popularity as a choice for privacy screens caused a lack of variety in the landscape. Lack of variety in the landscape, also referred to as monoculture, causes formerly minor pest issues to develop into major problems. Seiridium & Botryospaeria Canker: Easily the most concerning for Leyland Cypress’, Seiridium & Botryospaeria are both fungi that cause dieback in Leyland Cypress’. The first symptoms are typically a yellowing or fading of foliage on scattered lateral branches that later turns a reddish brown. The worst part about these fungi is that the common treatment used to fight fungi, fungicide, is largely ineffective against it. Cercosporidium Blight: This serious disease first discovered in 1887, has recently become a big problem for Leyland Cypress’. Symptoms include rusty brown patchy needles and twigs and overall dieback. Bagworms: Native to the eastern US, bagworms are defoliating caterpillars that create unsightly cone shaped bags. When populations get high, excessive feeding can strip away large quantities of leaves. Spider Mites: Spider mites are a common enemy of anyone who cares about their landscape plants. Classified as arachnids, these tiny tree bugs are less than 1/20 inch long when fully mature and look like moving dots to the naked eye. Their ability to rapidly reproduce allows large populations to develop fast and severely harm your plants before you even realize you have a problem. Root Rot: In soils that don’t drain well, Leyland Cypress’ will most likely develop root rot at some point. This is a condition caused by fungi which attacks the tree’s root system essentially causing the roots to rot away, hence the name. Root rot can usually not be cured but only suppressed by routine fungicide treatments and proper maintenance. Japanese cedar for a tall screen in a partly shady area. Hollies: Hollies are a great choice for tall, narrow situations and less restricted areas. They grow well in either sun or part shade. Savannah holly, Foster’s holly, and the Aqupernyi hollies (Dragon Lady, and Carolina Sentinal) are great for narrow areas. Lusterleaf holly and Nellie R. Stevens holly are good for less restricted areas. Broadleaf Evergreens: These evergreens make beautiful dense privacy screens. As an aesthetic plus they provide flowers or berries in certain seasons. 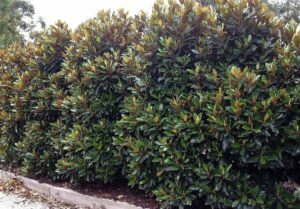 Magnolias: For tall and narrow privacy screen look for certain cultivars of southern magnolias such as Alta, Bracken’s Brown Beauty, and Edith Bogue. For medium height and compact look for the cultivar Little Gem. For moist soils look for Sweetbay Magnolias. Cultivars Henry Hicks and Santa Rosa can be used for most situations. Tea Olive: For tall privacy screen opt for fragrant tea olive, and fortune’s tea olive. The Best Solution – Mixed Species: When a plant becomes so popular that it is planted everywhere, formerly minor pest problems can develop into major problems. The issue is that even if you buy a species that isn’t popular today, it could become popular and suffer the same fate as Leyland cypress’. The real solution isn’t picking the best species, it’s diversifying your landscape and privacy screens. By grouping multiple species together in small clusters of 3 or 5, either in a single row, or in an alternate layered planting where possible you can help prevent the spread of problems from one tree to the next. In mixed screens, even if one species does develop issues and needs to be removed and replaced, the entire privacy screen will not be sacrificed. If you have a privacy screen that’s important to your landscape have one of our arborists come out and develop a plant health care plan. Give us a call at 703-573-3029 or schedule an appointment with one of our arborist.